There is a wide variety of stainless steel sanitary process connection systems used in the world. European sanitary fittings systems include DIN 11851, SMS, RJT and IDF fittings. Often, process equipment built in the Europe comes to the US with stainless steel piping using one of these connection systems. We build custom adapters to allow users to transition to sanitary clamp systems in a clean and efficient manner. List below is a brief description on the various European sanitary connection systems. There are possibly the European stainless steel fittings most people run into in the US. DIN (the German Institute for Standardization) union parts are used extensively throughout the UK and Europe. They are available in both Imperial and metric tube sizes. 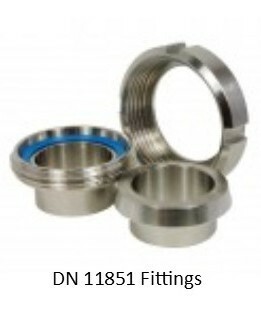 The DIN11851 union consists of a round slotted nut, weld male piece, a liner piece the nut slides over and gasket. The nut has round threads. Normally the wetted parts are supplied in 316L stainless steel and the nuts are grade 304. 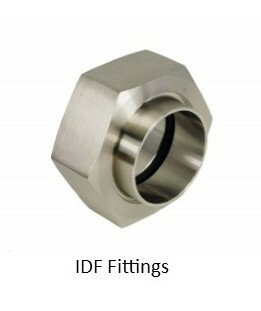 There is also an aseptic version of the DIN fitting. SMS (Swedish Metric Standard) Union is designed for use in applications that don’t require regular dismantling and they are not forgiving of tube misalignment, they do however have the advantage of being suitable for removal of adjacent pipe sections without disturbing other joints. The SMS union comprises of round slotted nut, a weld male end, and a liner piece the nut slides over and square section gasket. The nut has round threads. 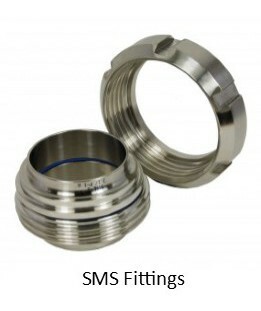 Normally shown in metric sizes, SMS fittings actually fit up fairly closely with imperial tube OD sizes. RJT (Ring Joint Type) is the most widely used union in the UK. The union comprises of a hexagonal nut, weld male, weld liner and a gasket. Wetted parts are 316L stainless steel and the nut is 304. 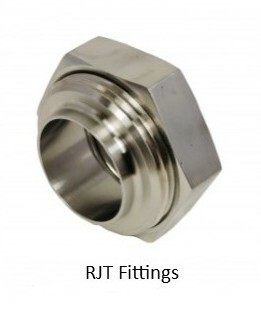 RJT fittings come in imperial sizes 1”-4”. Contact us if you need to adapt to any of these sanitary stainless steel fittings. Whether you have DIN 11851, SMS, RJT or IDF connections, we will help you identify what you need and build adapters specifically for your application. We also build adapters for domestic fittings such as I Line, Q Line, Bevel Seat and John Perry fittings.